Mama Cup Shrimp Tom Yum – Actually taste similar to Nissin Cup Tom Yum, but the Nissin one has more ingredients such as the seafood bits, while this one doesn’t have such luxury. Some folks bought the packet ones instead, I purchased the cup noodles just to try the flavour. But decided it was not tasty enough for me to buy the packet ones. Mama Cup Minced Pork Flavour – This is also available in packet version, guess some folks liked this cos it has a packet of fragrant lard oil as flavouring. Overall it tasted pretty savoury. Pretz Larb Flavour – Too salty for my liking…I preferred the Tom Yum flavour. Both flavours are now available in Singapore. Pocky Blueberry Taste – Also available in Singapore, just cheaper in Thailand. Quite nice cos of the chunky bits. 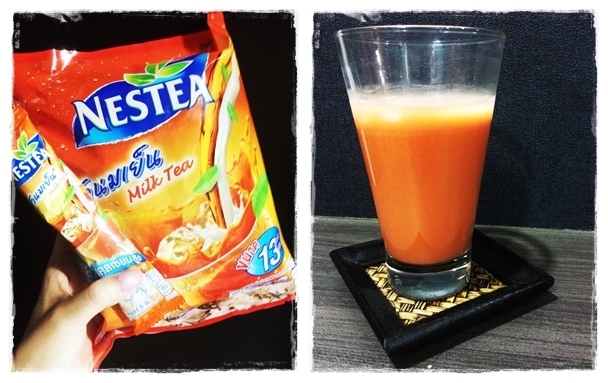 Milk Tablets – Bought 2 types from different brand and different flavours. Very milky taste for the original flavour. For the chocolate flavour, it kinda taste like the Ovaltine sweets I used to eat when young~ Not sure if Ovaltine sweets are still available in Singapore? Also bought Brand’s Birds Nest – Buy if you got spare luggage weight allowance. Regular price at NTUC is S$49.90 (without promotion) vs Thailand’s S$33-34. However I saw that when there’s occassional discount at supermarts in Singapore, it can go down to around $35. 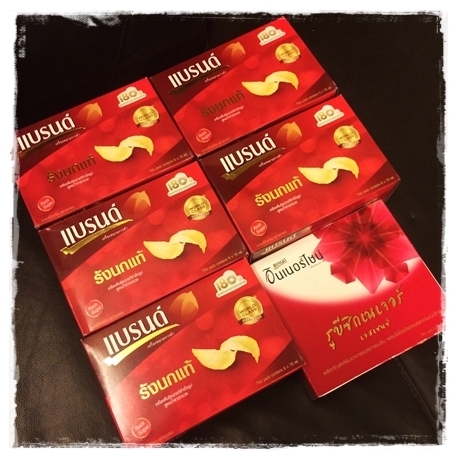 Collagen is also slightly cheaper in Thailand but saving is not as significant as Bird’s Nest. My final purchase at the Airport turned out to be quite tasty too. 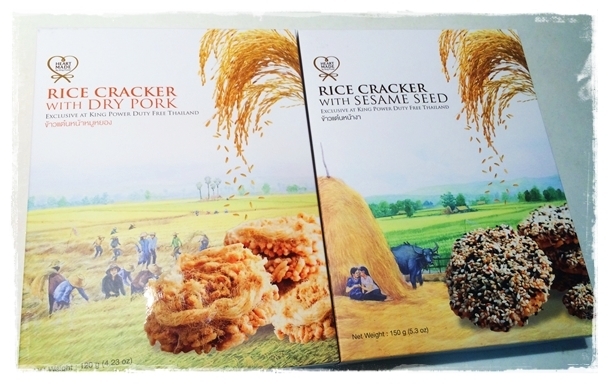 In the past I usually buy the pork floss rolls from supermart, but this rice cracker version is also very nice! The sesame seed version was more aromatic than the pork floss one. Bento Squid Seafood Snack – Red packaging ones are really spicy. 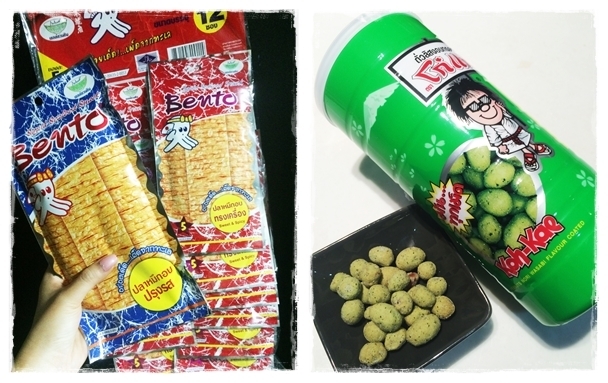 Koh-Kae Wasabi coated nuts – Available in Singapore too, but cheaper in Thailand. 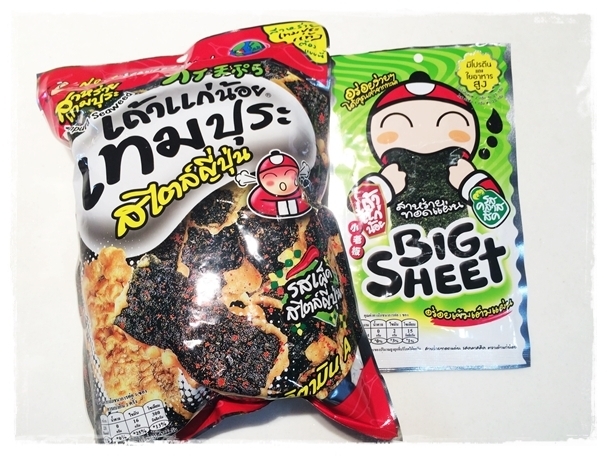 Tao Kae Noi Tempura Seaweed Occasionally found in Singapore marts, but seems pretty rare and not readily available. This one has a cracker stuck with a piece of seaweed. Fragrant and crunchy. 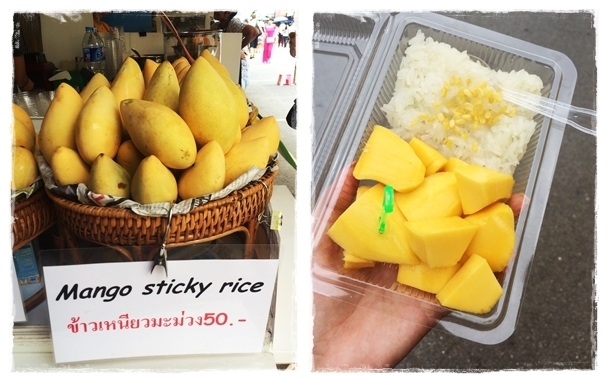 (1) Mango Sticky Rice Freshly cut mango and nice warm glutinous rice. More importantly its so much cheaper and tastier here! This one is approx. S$2. (2) Coconut Ice Cream with Buffet Toppings. Add all-you-can pile toppings. 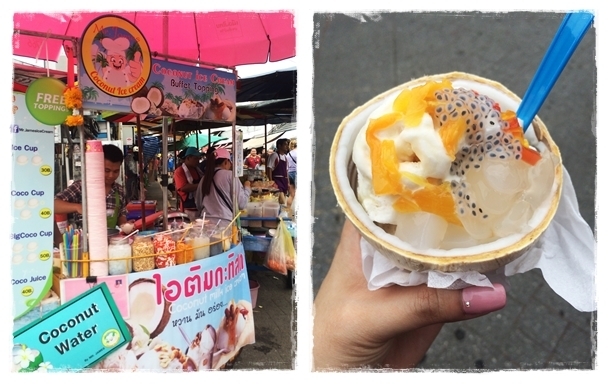 It’s cooling and refreshing to enjoy this in the hot Chatuchak market. 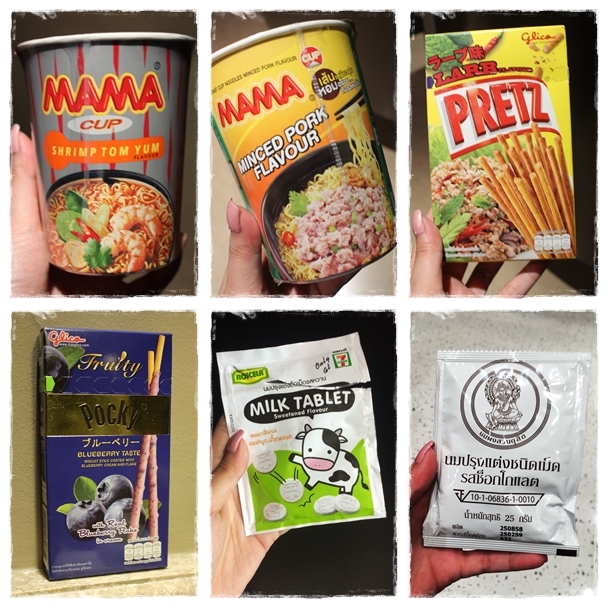 This entry was posted in Other Food, Thai, Thailand and tagged Bangkok, Bento Squid Seafood, Brand's Bird's Nest, Coconut Ice Cream, Koh-Kae, Mama Cup Minced Pork Flavour, Mama Cup Shrimp Tom Yum, Mango Sticky Rice, Milk Tablets, Nestea Thai Milk Tea, Pretz Larb, Seaweed, Snacks, Supermarket, Tao Kae Noi, Thailand, Wasabi Nuts. Bookmark the permalink.